Dune bashing involves guiding your off-roading vehicle over sand dunes. In technique, it’s like a combination of driving in mud and driving over hills. 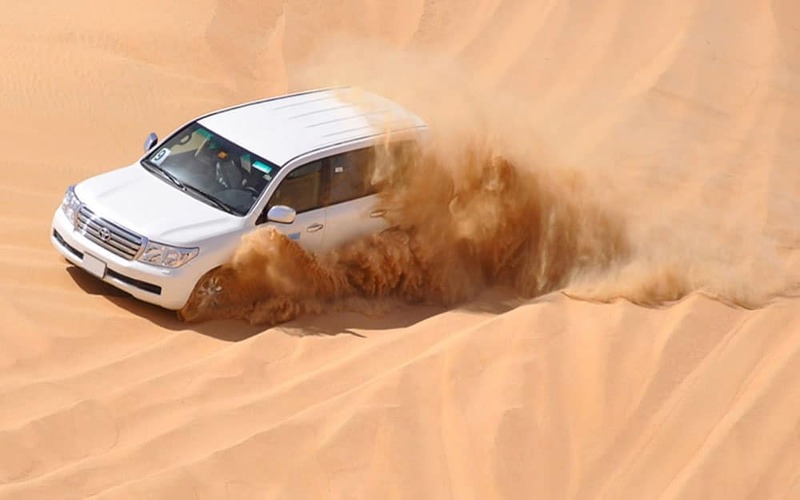 It’s a popular tourist activity in parts of Saudi Arabia and the United Arab Emirates, where sand dunes are plentiful and organized dune bashing excursions are available, but is illegal in many places where off-roading has been deemed a threat to the dunes. When scaling sand dunes, like any hills, knowing your off-roading angles is important. If you don’t know your approach angle, you might wind up bumper-first in the sand. If you don’t know your break-over angle, you may become stuck at the top of the dune. Momentum also figures prominently in dune bashing. Like any hill, you have to gain enough momentum to reach the top without stopping. If you do start to slow, you’ll have to either back down the dune or make a wide arc to turn around. Turning around on any hill is extremely dangerous because you’re at greater risk of rolling your car over and ending up upside down. Cars are designed so that they are less at risk of rolling over if they are pointing directly uphill or downhill. When they sit sideways or at an angle, they’re more likely to tip. Wider tires work best for dune bashing. Think about how a snowshoe works: The wide shoe disperses your weight across a larger surface area, making it easier for you to stay on the surface and not sink too far into it. The same principle is true for tires — the wider the tire, the less you will sink into whatever you’re driving through. Dune buggies, special recreational vehicles designed to drive on sand, tend to have wider tires for this purpose. In addition, reducing your tire pressure can help to give your tires a wider surface area. You also might encounter hills when you’re green laning. Read on to learn why green laning is a popular pastime for even the non-hard-core off-roaders.